Editor’s note: Bahiyyih Nakhjavani and Shahram Yazdani translated the poems and Iran Press Watch translated the rest. 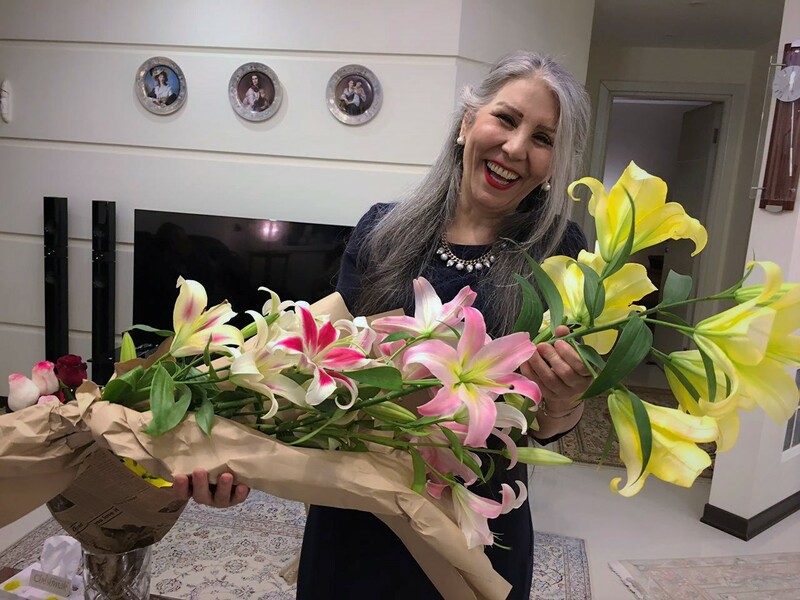 Mahvash Sabet, a member of the Baha’i Community of Iran, who has been in prison due to her religious beliefs, was released from Evin Prison on 18 September 2017, at the completion of her 10-year prison sentence. Mrs. Sabet is one of seven individuals, known as the “Yaran”, who were arrested in early 2008. The Yaran aided the administration of the affairs of the Iranian Baha’i Community after their formal institution, The National Spiritual Assembly of the Baha’is of Iran, was forcibly disbanded by the Regime. The Yaran were tried and sentenced to 20 years each, for their work serving their Faith. The sentences were later reduced to ten years. Despite repeated demands by international human rights organizations for the immediate release of these prisoners of conscience, the remaining six members of the Yaran remain in prison. Mahvash Sabet was born in 1952 in the City of Ardestan in the Fars Province. Upon completion of her university education she started work as a teacher. However, along with many Baha’is, following the 1979 Revolution Mrs. Sabet was fired from her teaching position and barred from any public and governmental employment. Mrs. Sabet is not known solely for her imprisonment as one of the members of Baha’i Community Leaders. She is also a talented poet, and in recent years her name has become known in international literary circles. An anthology of her work written during her incarceration, Prison Poems, was translated by into English in 2013. At the 2016 Montreal’s Book Exhibition she was recognized in a commemorative ceremony as an imprisoned poet. Over the years her poems have been translated to other languages, including French. “I was always very interested in literature and especially some of the traditional Iranian poets like Hafez, Maulana (Rumi), and sometimes Sanai, but I did not have much experience in poetry. In the prison when I was in the solitary, I felt like I wanted to write. I really didn’t exactly know what I was writing, whether it was poetry, just words or numbers, but just liked to write, and since there was no pen or paper, I wrote somethings in my mind and memorized them. Shortly after I realized that I could use the margins of the newspapers as paper and I wrote things for my father, for my husband, for my daughter, for my sister; those who were suffering for me on the outside, and I knew how much they are in pain and I can’t do anything here to help them. I expressed my feelings by writing poetry, and I tried to keep this up. Eventually, I felt that this is part of my life, prison became easier to endure for me, especially the two and a half years of solitary confinement, without enough books and of course naturally with all the limitations. I became closer to poetry and I started to write more poetry, I continued to write, poetry was always with me, as a friend, a companion, a consoler”. What are they doing to us in this perilous place, this prison of loss? But what can they do to a handful of dust in the middle of chaos? If they cut open our veins, red tulips will blush like blood in the fields. If they padlock our lips, the mouths of a thousand spring buds are unsealed. If they daub us with mud, the dead will arise to judge their crime. If they shatter the water jug, spill the cup, the world floods with our wine. If they kick in our heads, they crown our brows with an azure dome. If they press thorns on our temples, the breath of Jesus resuscitates the tomb. If they dig pits at our feet or throw us in wells Joseph’s beauty becomes renowned. There is nothing to fear in their tempests or storms while the seas are Noah’s own. Why would we care for cracked earthenware with precious gems at hand? As soon as they chain down our feet, they free the albatross of the mind!